We’re coming off the time of you in which it was the season to, “Deck the Halls.” Now is a good time to think about overhauling the deck. You may look out the back door of your DeKalb-area home and think that it’s a little early (and cold!) to be considering outdoor activities. But great decks don’t happen overnight. That’s why we’re sharing 4 deck designs to get your excited for spring. We all know the old adage about how the early bird gets the worm. It’s a little bit like that with home remodeling projects—only better. Getting started early with planning enable you to take the time to think about what you really want to accomplish with your home renovation—whether it’s adding a deck or remodeling your kitchen or bath. There’s another advantage to beginning your planning now. When the weather warms up and lots of homeowners in the area start thinking about adding a deck, guess what happens to the time it takes to complete a project? If you already have a plan—and have already contacted a contractor, you’re first in line. You can be enjoying your new deck for weeks (maybe even months) while your neighbors are missing out on those great spring days on the deck. It may be a little early to fire up the grill, but it’s not too early to fire up your imagination so that you’re ready to roll when the time is right. With that in mind, here’s a look at 4 deck designs that can make your deck the favorite room in your house this spring and summer—and even into the fall! A lot of homeowners love being outside when the weather permits. It's great to be able to entertain friends and family in a casual, yet comfortable place. Of course, Mother Nature sometimes has something to say about that. Spring, summer, or fall showers are a pretty common affair around DeKalb. But that doesn't mean it has to rain on your outdoor entertaining parade! Here's an example of a partially covered deck that provides a comfy seating area you can enjoy even in light rain. You'll also notice that this part of the deck includes a ceiling fan to keep the air moving on those warm and humid DeKalb summer days and nights. Here’s a great deck for dining. It really feels like an extension of the house. If you’re the grill master, you don’t have to be stuck alone at the grill. Your family and guests can comfortably join you on the deck while you cook. 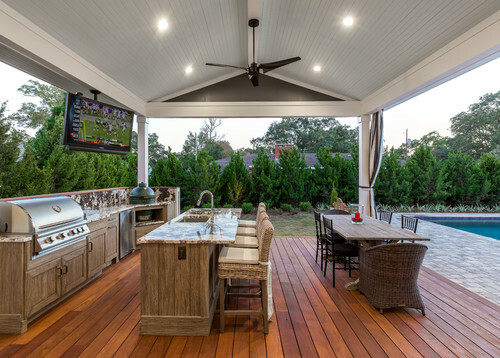 This deck kitchen/dining area has everything you need for great entertaining: Grill, sink, refrigerator, and even a counter when you have a small group—or just want to grab a drink and some snacks while watching a game. 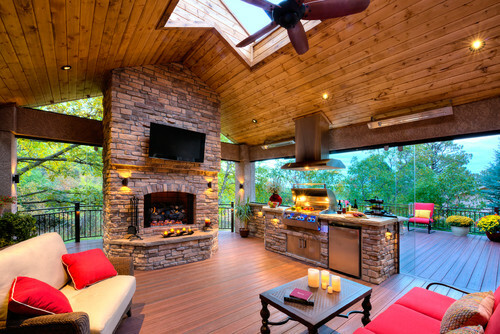 One big remodeling trend that’s surfaced over the last few years is the blurring of lines between inside living and outdoor living. For many homeowners, the deck has become one of the favorite rooms “in” the house. Here’s a look at a more traditional deck that’s anything but boring. The beautiful deck and railing really add a nice contrast to the back of the house. One thing to consider is using engineered “wood” for the surfaces. Today’s engineered decking material can be absolutely stunning (you’ll swear it’s wood) and it holds up better against our tough Midwestern winters—without needing to be treated. These are just a few of the possibilities to consider for the deck in your DeKalb-area home. Now is a great time to start collecting ideas—and working on a plan with your remodeler so that you’ll be ready to enjoy your new deck this coming spring and summer.